From the 'Schema Editor,' you can customize the current set of labels defined in your project's database schema. Note, that in order to perform each of the tasks outlined below, it is necessary to first click on "Labels" in the 'Schema' tab of the left sidebar. This toggles the view to display a list of the currently defined schema-based labels. Within the 'Schema Editor,' ensure "Labels" is highlighted in the left sidebar. Click the blue 'New Label' button located on the toolbar. The view will update to display a 'Create New Label' form. 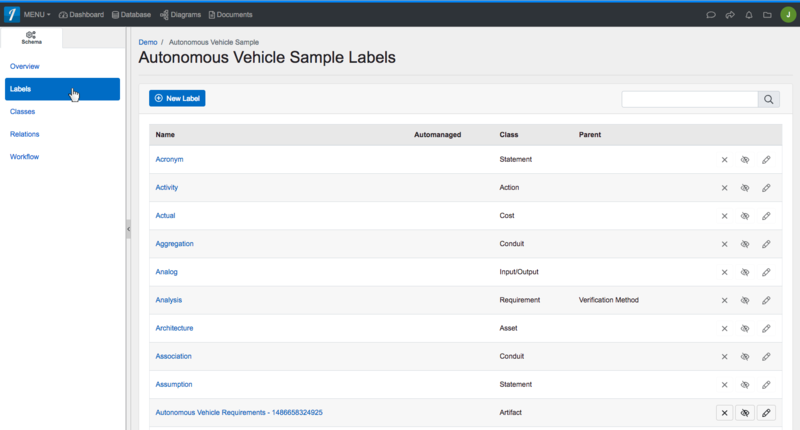 Here you can quickly type in a name, description and other attributes of your new label. When you have finished entering information, click the 'Save' button located on the toolbar to persist your changes to your project's database schema. Locate the label you’d like to edit and click the 'Edit' button on the right within the label's displayed row. The view will update to display an 'Edit' form where you can change attributes of the existing label. Note that the 'Schema Editor' only allows users to edit attributes of user-defined labels added to the default schema. All labels included in the schema by default are locked. Click the 'Save' button located on the toolbar to persist your changes to your project's database schema. Locate the label you’d like to delete and click the 'Delete' button on the right within the label's displayed row. You can also delete a label from the 'Edit' form. Note that the 'Schema Editor' only allows users to delete user-defined labels added to the default schema. All labels included in the schema by default are locked. Locate the label you would like to hide and click the 'Hide' button on the right within the label's displayed row. If you'd like to show an already hidden label, click the 'Show' button on the right within the label's displayed row. From the ‘Schema Editor,’ you can customize the current set of labels defined in your project’s database schema. Note, that in order to perform each of the tasks outlined below, it is necessary to first click on “Labels” in the ‘Schema’ tab of the left sidebar. This toggles the view to display a list of the currently defined schema-based labels. Within the ‘Schema Editor,’ ensure “Labels” is highlighted in the left sidebar. Click the blue ‘New Label’ button located on the toolbar. The view will update to display a ‘Create New Label’ form. Here you can quickly type in a name, description and other attributes of your new label. When you have finished entering information, click the ‘Save’ button located on the toolbar to persist your changes to your project’s database schema. Locate the label you’d like to edit and click the ‘Edit’ button on the right within the label’s displayed row. The view will update to display an ‘Edit’ form where you can change attributes of the existing label. Note that the ‘Schema Editor’ only allows users to edit attributes of user-defined labels added to the default schema. All labels included in the schema by default are locked. Click the ‘Save’ button located on the toolbar to persist your changes to your project’s database schema. Locate the label you’d like to delete and click the ‘Delete’ button on the right within the label’s displayed row. You can also delete a label from the ‘Edit’ form. Note that the ‘Schema Editor’ only allows users to delete user-defined labels added to the default schema. All labels included in the schema by default are locked. Locate the label you would like to hide and click the ‘Hide’ button on the right within the label’s displayed row. If you’d like to show an already hidden label, click the ‘Show’ button on the right within the label’s displayed row.